The twenty-fifth President's Cup Race, held in the Georgetown Channel of the Potomac, Washington, D.C., Sept. 15 and 16, was marred by the collapse of a section of the stands at the start of the final heat; 34 were injured, two of them seriously. The A.P.B.A. sanctioned event was won by Miss Thriftway, who set a 104.449 mph lap speed and 101.427 mph heat speed, breaking Tempo VII's 1955 records. The boat ripped open a sponson on the second turn of the first lap in the semi-final heat, but fast work got her ready for the final, in which she finished second to Miss Pepsi, and took the Cup on points. 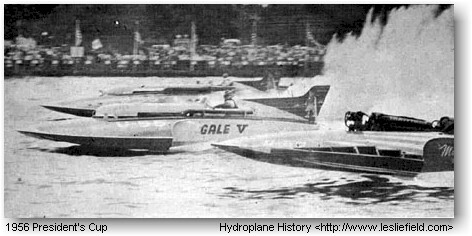 Later, Jack Regas drove Hawaii Kai III to victory in the William Rogers Memorial for the American Speedboat Championship, surpassing Thriftway's Gold Cup speeds with a 105.675 mph lap and a 103.487 mph heat. Hawaii Kai is a Jones-Staudacher Allison-powered craft out of Seattle, owned by Edgar F. Kaiser.